Welcome to the Shine 9! In honor of next week’s Earth Day, this month’s Shine 9 is featuring Lauren Patterson. 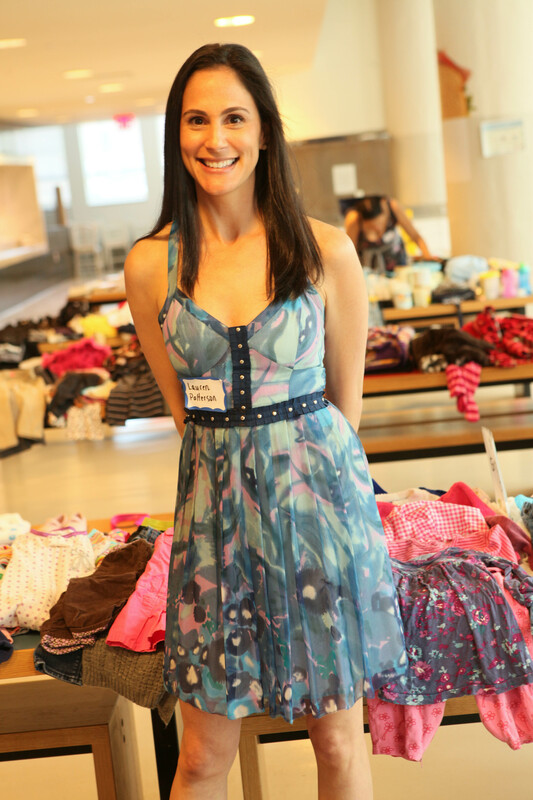 In 2012 Lauren founded Little Swappies as a way to help families reduce, reuse, and recycle through community kids clothing, book, and toy swapping events. Over 2,000 attendees in Manhattan, Brooklyn, and New Jersey have exchanged their pre-loved gear, keeping over 50,000 items out of landfills. Lauren lives in Manhattan with her husband and 2 children. Check out the Little Swappies website for information on the next event near you, make a donation, or find out how to volunteer. I love Goodnight Moon because the kids have it memorized at this point and we read it out loud together. It is a book that I remember reading as a child which makes it even more special. We pretty much stick to Sesame Street and Dora the Explorer in the house TV-wise, but I am obsessed with the Classical Baby Music DVD. The music is beautiful and the scenes are creative that it is enjoyable for everyone. We love to turn their dining table and chairs into a rocket ship. We created a steering wheel out of cardboard and a mop that we attach to the table and we have a mast taped to the back of one of the chairs. It is fun to see how creative they get, using household items as controls and accessories. We limit their TV to an hour of Sesame Street most days. We allow them to watch videos on the computer, but try to find educational topics. Princesses in general. Having a girl and a boy, you see the push for girls to like princesses at such an early age. I personally find it distressing. There isn’t one thing that stands out. They literally crack us up every day with the things that they say. I would be an expert of living in the moment. It is something that I work at every day. I have already had the experience of working in a variety of industries – the music industry, as a lawyer, at non-profits, and now as an entrepreneur, working for myself. Growing up, I don’t have any recollections of dreaming of a certain career, but now as an adult, I am grateful to have had the opportunities to experience such different types of work. My mom’s pistachio chocolate cake. It is still my favorite after all these years. 9. What was your most memorable birthday party? My 30th birthday because my husband surprised me and popped the question.